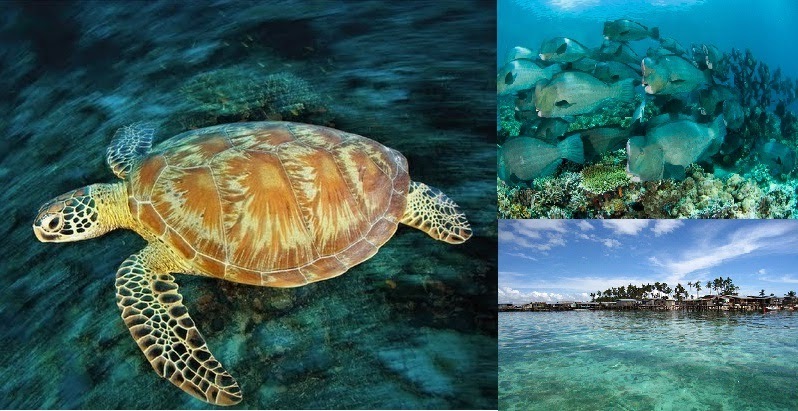 An underwater census of resident sea turtle population will be conducted at Mabul by the Borneo Marine Research Institute (BMRI) of Universiti Malaysia Sabah (UMS) in conjunction with the World Turtle Day 2013 from May 22-24. In collaboration with the Ministry of Tourism, Culture and Environment, the institute will bring in local and international volunteers to catch, photograph, measure and tag the resident turtles found in the waters of the world famed island off Semporna. The objective of this event is to create public awareness, while enhancing education, research and conservation of the sea turtle population in the waters of Mabul. The event will serve as a follow-up project to a recently concluded study conducted by the institute and this will also be the culmination of the prelude to Mabul World Turtle Day held in March where researchers and volunteers successfully caught and tagged 21 turtles. The head of a BMRI research team studying the Mabul turtle population, senior lecturer Dr Pushpa Palaniappan said they had been working with several partners to carry out the programme, namely Uncle Chang’s Resort, 1Borneo Ballroom Sdn Bhd and The Borneo Connections Sdn Bhd. Besides from enthusiastic volunteers who have signed up for the programme, the event would also be opened to resort guests in Mabul to allow them to get hands-on experiences on sea turtle research. BMRI director Professor Dr Saleem Mustafa in calling for support for the project, said research on sea turtle was important as it would help the community better understand how to conserve the endangered species effectively. He told that consumption of turtle eggs has remained among the major factor, threatening the survival of the species in Sabah, along with pollution and harmful fishing methods. The event will be officiated by Assistant Tourism, Culture and Environment Minister Datuk Pang Yuk Ming. The institute is hopping to make the celebration of the World Turtle Day in Mabul an annual event recognized by the State Government not just for its conservation significance but also as a platform for promoting eco-tourism.